Tender Apple Berry Coffee Cake topped with blueberries, raspberries and apples. Perfect as a dessert or for breakfast. I love a good slice of coffee cake with my morning coffee. What I don’t particularly like is a coffee cake that reminds me of a sugary dessert. I love it when I can find a coffee cake that is slightly on the sweet side, not at all dry and an added bonus would be if it’s liberally studded with fruit. This kind of coffee cake makes a great breakfast bread and a real show-stopper to serve when a friend or a neighbor stops by for coffee. It also makes the ideal treat to enjoy with a cup of tea in the afternoon – not too sweet, just right. The texture of this Apple Berry Coffee Cake reminds me of the texture of a pound cake. It’s a little dense which makes it perfect for supporting the fruit. I bake my Apple Berry Coffee Cake in a 9-inch springform pan. This type of pan allows me to release the sides so that they can be removed from the base. The fruit topping is a mix of blueberries, raspberries and apples which are placed on top of the cake batter. Fresh or frozen berries that have been thawed first work just fine. I sprinkle a bit of brown sugar over the fruit and a few dots of butter and bake it in the oven for about 25 minutes. Lightly grease a 9-inch round cake pan or springform pan. Set aside. In a medium bowl, whisk together the flour, granulated sugar, baking powder, nutmeg, salt and lemon zest. 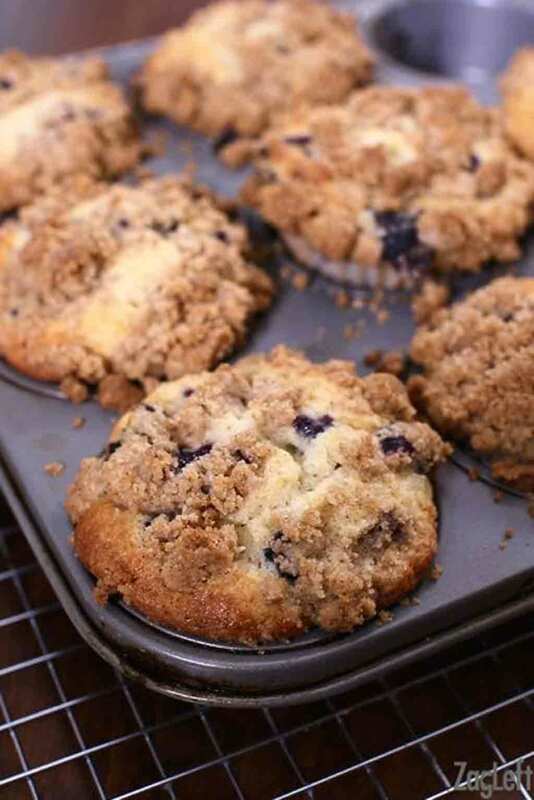 With a pastry blender, two knives or your fingers, blend in 1/2 cup butter until crumbly. In a small bowl, whisk together the egg and cream. Add to flour mixture and mix just enough to incorporate; do not overmix. Press the dough evenly into the bottom of the cake pan. Place the blueberries, raspberries and diced apples on top of the dough and sprinkle with the brown sugar. Place the remaining 2 tablespoons butter pieces over the fruit. Bake for 20-25 minutes, or until golden brown. Cool on a wire rack. Remove cake from the pan, slice it and serve with whipped cream or vanilla ice cream. This looks amazing Joanie and I love that it is more of a pound cake consistency. I’ve never been a big fluffy cake fan, but this one looks so rich and perfect – pinned to try it! I love a good coffee cake! It’s one of the few types of cakes I can actually bake! Love this apple berry combo! What a yummy combination of ingredients (and so pretty, too)! Can’t wait to give this a try! Wow, this looks like the PERFECT breakfast!! I’ve never had a coffee cake with fruit in it but now I’m intrigued. It’s such a natural combination! I am originally from Germany and I LOVE fruit coffee cakes. We have a traditional “coffee and cake” time around 4pm every day and I cannot wait to make this cake for the weekend! It looks just like home! Breakfast cakes are totally one of my favorite things. It feels so decadent to have a slice of cake in the morning! Do you have a recommended apple varietal for this recipe? I always seem to find myself using Pink Ladies but I’m thinking this may need something a little more tart? Looks great! Can’t wait to make this! Pink Lady would be an excellent choice. I would also recommend Gala, Honeycrisp or Golden Delicious. Oh my goodness that looks so good! I’m going to have to try it! Thanks! That’s exactly the type of coffee cake I like, too! This looks like a great addition to our regular moms’ brunch menus! Love that you used a springform pan for it. So smart! This coffee cake looks delicious. Would be perfect for Easter brunch! Well the coffee cake looks so yummy! What a great spring time breakfast. Love all of the fruit added to the coffee cake. Will try this soon! Thank you. I seriously need to make this, it looks SO good. I haven’t have coffee cake in forever, but I love it! What a perfect breakfast! YUM! I’d take a slice with a dollop of whip cream, please! Saving this recipe to try for Easter. This is absolutely beautiful. I adore coffee cake, and this one is extra special with that fruit. Great idea with topping it with cream, whipped cream makes everything extra yummy! This looks like a perfect breakfast coffee cake! I always love to get some fruit in my breakfast pastries! Oh that coffee cake looks absolutely delicious! There is little better than a warm piece of delicious coffee cake with my morning cup. This looks so pretty and inviting, too! Yum! Yummy, this is my kind of cake! I’d love to have a piece for breakfast right now! This is such a gorgeous looking cake! Love all those tasty berries…yum! That looks so good! I just love all the fresh berries baked into it. The berries in this coffee cake just look perfect! I would love to have a slice with my coffee in the morning! Using a springform pan is so smart! So much easier to get it out!